SPEAKER:	The Mackay-Stone Report, which is the government’s cornerstone report into selling fracking to the nation has now been exposed as fake science, dodgy data, and a dodgy dossier. TINA-LOUISE ROTHERY:	The Mackay-Stone Report was a report that came out after a study that was done that was called the Howarth Study. Now the Howarth Study came out in 2011, and that was Ingraffea and two other gentlemen who did the study. It was a really thorough but very damning study of the shale gas industry. PAUL MOBBS:	That was just as the government were launching the shale oil and gas strategy in Britain, and it looked rather bad that this report came out saying that shale gas is worse than coal. So they commissioned the DECC, the Department of Energy and Climate Change, scientific advisor and an economist to look at the issue and produce a report for the government saying what the state actually was. TINA-LOUISE ROTHERY:	The processes looked reasonable, but where were they getting those figures? PAUL MOBBS:	So we have the industry figures, which use a system called inventory analysis. The inventory method is called bottom-up, because you break the system down into its component parts at the bottom. So they recreated bits of equipment in laboratories, work out what each piece is creating, that is the inventory, and by adding all the bottom bits together, you work upwards to produce a top-level figure. The inventory analysis approach, it’s been known since the 1990s that it always underestimates. So now they can take the equipment out into the field. What the instrumental method finds is that the real emissions can be anything from a factor of two to nine times higher. That’s why these two figures are different; one is an estimate, which is what the governments and the international organizations base their figures on, which is mostly estimates, and one is a measure of the actual level of pollution. Since then, we’ve had 40 or 50 new studies, most of which either criticize inventory analysis by showing that the figures aren’t very representative of what’s really happening, or they’re showing much higher levels because they’re monitoring the actual pollution that was in the environment. SPEAKER:	We know from the International Panel on Climate Change that the next 20 to 30 years are the most important in terms of reducing our emissions so that we don’t pass the two-degree tipping point where we cannot stop the runaway climate change. PAUL MOBBS:	When you emit carbon dioxide, it’s quite long-lived, and so by measuring it at 100 years, you’re measuring how much persists in the environment. Methane has a higher warming effect but most of that effect happens in the first 20 years, because it traps heat almost immediately and then slowly over time turns into carbon dioxide, and so you wouldn’t look at the effect of methane over 100 years because most of it wouldn’t exist. You have to look over 20 years. JOE CORRE:	The Mackay-Stone Report, of course, used a 20 times figure after the 100-year period, which to say the least is disingenuous, particularly if their report was supposed to be looking specifically at the effect fracking would have on climate change. PAUL MOBBS:	If you’re looking at the 20-year global warming potential, if it leaks more than two percent, it’s worse than coal. We’re talking leakage rates which are acknowledged by the government of a half to one percent. If that’s an underestimate of three or four times then you’re up into that range which makes shale gas as bad as coal. TINA-LOUISE ROTHERY:	There is a duty of care in government, a duty of care to our children, and they are not fulfilling that. Worse than not fulfilling it, they are positively putting them at risk by sending out false signals, false reports, and lies. JOE CORRE:	It’s critical that people understand the ramifications of the Conservative Party Manifesto as we head into this election. It affects our future, our children’s future, and the environment and habitat that we have to live in and survive on. The Infrastructure Act in 2015 created a new definition for fracking, and they defined it as using less than 10,000 cubic meters of toxic fracking fluid, the equivalent to four Olympic-sized swimming pools. Anything that uses a bucketful less than four Olympic-sized swimming pools will be allowed to be pushed through under permitted development. What you will find is that any drilling for petroleum and such is exempt from any objections from the council and therefore local people. Permitted development also means that the council do not have to give notice of any planning applications from the fracking companies to local people. The first time you’re going to know about it is when they turn up on your doorstep, and it will be too late and there’s nothing you can do about it. 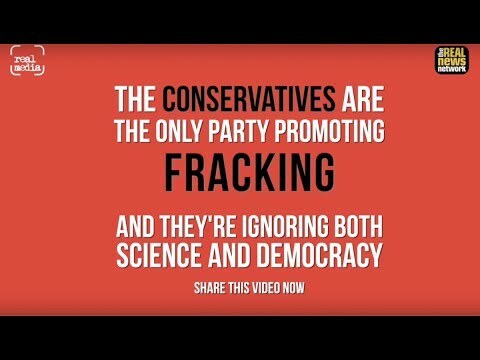 VIVIENNE WESTWOOD:	If you put that into perspective, in the last 10 years 90% of the fracked oil wells in America and 45% of the fracked gas wells would be non-fracking. TINA-LOUISE ROTHERY:	And you can have 10 to 40 wells on one pad, and each of those will be fracked multiple times. They’re talking in Lancashire of giving us the first super-pad in the world. They’d like 48 wells on this pad. PAUL MOBBS:	The situation at the moment is we’ve got a government who’s given out a lot of licenses, and the operators now want to get on and drill. So by the end of 2017, you could have four or five active drilling sites across Britain. TINA-LOUISE ROTHERY:	We’re literally within weeks of the first drill going in for the first full production site in the UK. PAUL MOBBS:	There is no low-carbon bridge. There is no easy way of de-carbonizing. We just have to take the carbon out of the system, and we can do that. We know how to do that, but we’re talking about an industry that’s got a multi-trillion dollar turnover globally. Getting them to change is very difficult. VIVIENNE WESTWOOD:	The best thing anybody can do is switch the green energy supply. If we do that, that’s real people power, and it would stop fracking, because it would completely undermine the rotten economy that favors investors and not people. It’s actually even more important than voting is just to press that button and switch to green energy supply.